Mongolia rarely attracts the attention of geopolitical analysts and commentators. The country that lies in the very center of Asia for a long time has been perceived as a modest satellite of the Soviet Union. These days Mongolia learns to pursue its own interests and find useful friends. Now-a-days the so-called third neighbor strategy dominates the foreign policy of this parliamentary republic. It can be described as a pursuit of cooperation with influential countries of the world that can assist Mongolia in developing its economy and defend its interests. Among these states one may find the United States, Japan, Great Britain, Germany, South Korea, Turkey, and even India. The third neighbor policy is not directed against the first two neighbor: Russia and China, which is expressed in Ulaanbaatar’s reluctance to get in associations that in one or another are directed against the two main neighbors of Mongolia – the People’s Republic of China and the Russian Federation. Nevertheless, the rapid growth of China makes the Mongols fairly concerned. The Mongols are afraid that they will not be able to counter-balance the influence that Beijing exercises with establishing closer relations with any other equally powerful state. At this point it would only be fair to state that Mongolia has been developing its relations rapidly only with the so-called third neighbors. As for the triangle of Mongolia-Russia-China, Russia’s positions in this country have weakened considerably over the last couple decades, while Mongolian-Chinese relations still developing more dynamically. At present, over 50% of Mongolia’s external trade turnover goes to China, with Russia getting less than 20% of that. Mongolia lies near the eastern border of Central Asia and it’s been known for its nomadic traditions that have been pretty common among the people the region. At the same time it shares a number of cultural features with the people of East Asia and China. The development of partnership between the EU and Mongolia has been hampered by the geographical distance of this country and low levels of awareness about it among the residents of Western Europe. But recently Europe’s approach to Mongolia has evolved, as Mongolia’s efforts to build a democratic society pushed the European Union into making all sorts of proposals to enhance cooperation with Ulaanbaatar. By occupying an important junction that leads to the north-eastern part of Asia, Mongolia may be of much use for the European Union as a gateway to the Asian northeast market. Moreover, Mongolia shares a border with Russia’s mineral rich region of Far East and northwestern provinces of China. Thanks to the extensive financial assistance provided by Japan, Germany and the United States, Mongolia has already restructured its economy and adopted market principles. Today, Mongolia is on the eve of the seventh round of presidential elections, with the Mongolian people deciding who is going to be their next president on June 26. A total of three political parties that managed to get seats in the parliament in last year’s elections were allowed to announce their candidates. 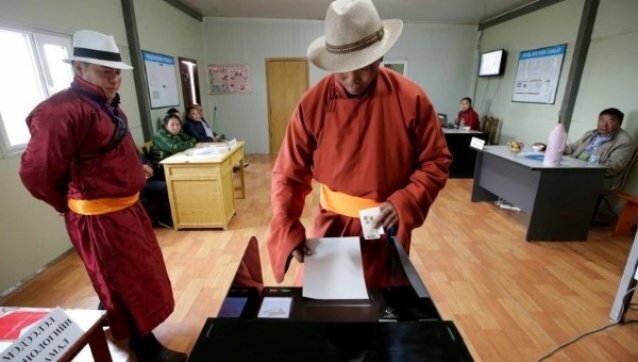 According to the local election law, the candidate nominated for the highest office in Mongolia cannot be younger than 45 years old, should be a native of Mongolia, and should reside in the country for at least 5 years in a row prior to his or her nomination. The current president Tsakhiagiin Elbegdorj will not be nominated because he has had two terms in office already. As a result, three people will compete for the post of Mongolian president: Sainkhuugiin Ganbaatar from the Mongolian People’s Revolutionary Party (MPRP), Battulga Khaltmaa from the Democratic Party (DP) and Miyeegombyn Enkhbold from the Mongolian People’s Party (MPP). This year’s candidates for presidency can be described as follows: Miyeegombyn Enkhbold as pro-Chinese; Battulga Khaltmaa as anti-Chinese; Sainkhuugiin Ganbaatar as a more neutral politician. Whether Mongolia is going to be pro-China or anti-Chinese, and, to what extent, is not just a matter of preference, since it’s going to affect the situation in the country big time. At this stage of its development, Mongolia faces a number of serious social and economic challenges. While being in possession of impressive natural resources, Mongolia doesn’t have sea access. As for the prices on minerals, they’ve been crumbling on international financial markets lately, forcing Mongolia to carry out structural reforms in order to prevent a reduction in the volume of foreign investment. The growth of the Mongolian economy in 2017, according to economists, is unlikely to surpass the 1% level. What reforms are to be taken and what specific sectors of the economy are going to be affected by them – the winner of the presidential election will have to find an answer to this puzzling question. Ulaanbaatar has taken China’s One Belt – One Road project pretty positively, showing interest towards the idea of rebooting economic relations in the Russia-China-Mongolia triangle. The integration of the transport and economic infrastructures that OBOR proposes may lead to the creation of an effective mechanism that balances the positions of each of the participants. From the point of view of Russia and China, Mongolia’s full participation in the Shanghai Cooperation Organisation is of vast geopolitical importantce, since it will weaken the possibilities of Washington to exercise its destructive influence in the region by financing international terrorist groups in the Eurasian space. Mongolia as part of the SCO will also strengthen the economic cohesiveness of the region, and its integrated security. In addition, Mongolia hopes to strengthen its cooperation with the APEC, in order to take a more proactive posture in regional affairs. Therefore, it is not surprising that the leaders of the two largest powers of Eurasia, China and Russia, unequivocally urge Mongolia to pursue a closer geopolitical union, and have been trying to spark Ulaanbaatar’s interest by putting forward all sorts of mutually beneficial projects. The history of Mongolia’s participation in the work of the Shanghai Cooperation Organization started back in June 2004. Then at the Tashkent summit of this organization, Mongolia became the first country with the status of a permanent observer. After that, Mongolian representatives took part in a great many of SCO events, with Mongolia hosting a number of them. By all evaluations, Mongolia is the most desirable permanent member of the SCO and the least “problematic” of all. The very location of the country between the two leaders of the SCO – Russia and China – speaks in favor of the active involvement of Mongolia in the activities of this organization. However, the specific direction of the political future that Mongolia is going to have will largely be determined in the coming days – on June 26.